Tag Archive | "Mackinac Bridge"
Michigan Day is a new twist on a tradition that began more than 60 years ago. On Saturday, May 6, the Michigan History Center in Lansing debuts a new signature event celebrating our Michigan pride. Michigan Day features free admission, special guests, activities, hands-on explorations, demonstrations and make-and-take projects highlighting the full range of Michigan’s diverse history. The event takes place from 10 a.m. to 4 p.m. at the Michigan History Center, located at 702 W. Kalamazoo St. in downtown Lansing. Although Michigan Day is new, the idea behind it is not. In 1950, a group of Michigan business leaders formed a task force to promote Michigan as a great place to live and start a business. Michigan Week was born out of the initiative and first celebrated in 1954. The inaugural celebration ended with the groundbreaking ceremony for the construction of the Mackinac Bridge. Costumed docents will represent all eras of Michigan history and run hands-on activities for visitors of all ages. Explore the storytelling and cultural objects of Michigan’s First Peoples with special guests Pokagon Band of Potawatomi. Watch a Civil War artist sketch scenes – and maybe even take a sketch home with you. Meet with Rosie the Riveter to learn about steel pennies and the Arsenal of Democracy and even hear a song. Celebrate the birthday of one of Michigan’s most famous rockers and vote on your favorite tune. Try your hand at making old-fashioned radio sound effects. Say ‘hello’ to the Lansing Flotilla of the United States Coast Guard Auxiliary and learn about safety on the Great Lakes. Visit the Library of Michigan and try your hand at a family-friendly paper craft featuring the beauty and history of the Water Wonder Land. Learn about the Detroit 1967 Project with the Detroit Historical Society. Take part in more than 20 other hands-on activities celebrating Michigan’s unique past and present. 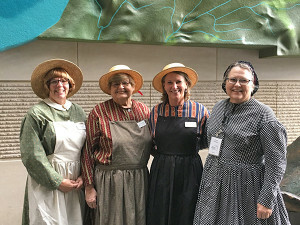 Free admission for all visitors on Michigan Day is courtesy of the Docents Guild & Associates, the 501(c)3 organization that serves the Michigan History Center volunteer program. The sponsorship is in memory of Bill and Marilyn Cochran. 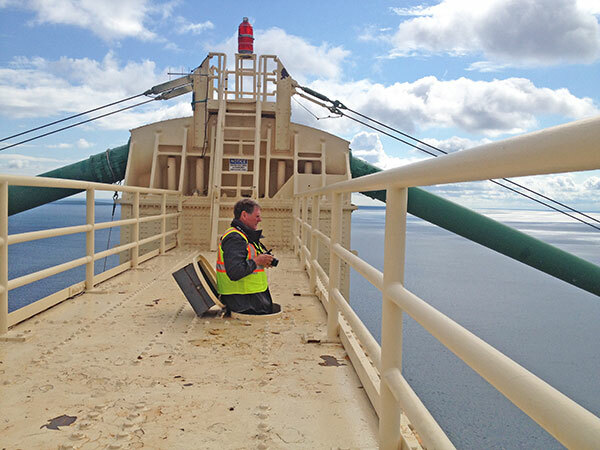 Bill was an original member of the Mackinac Bridge Authority and served there for 16 years. The Michigan History Center and visitor parking are on the north side of Kalamazoo Street, two blocks east of M. L. King Jr. Boulevard. Weekend parking is free. The Michigan History Center’s museum and archival programs foster curiosity, enjoyment and inspiration rooted in Michigan’s stories. The center includes the Michigan History Museum, 10 regional museums, Thunder Bay National Marine Sanctuary and Underwater Preserve, and the Archives of Michigan. Learn more at www.michigan.gov/michiganhistory. August 29, 2016 – Have you made plans for the annual Labor Day Mackinac Bridge Walk? If not, it’s coming up quick. Gov. Rick Snyder will lead the expected 40,000 walkers across the 5-mile span beginning at 7 a.m. Monday, Sept. 5. Walkers can start across the bridge up until 11 a.m., and buses are available to bring walkers from Mackinaw City to St. Ignace for $5. 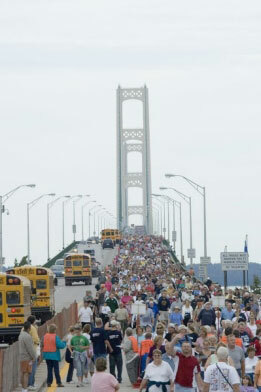 All details on the walk are available on the Mackinac Bridge Authority (MBA) website at www.mackinacbridge.org. 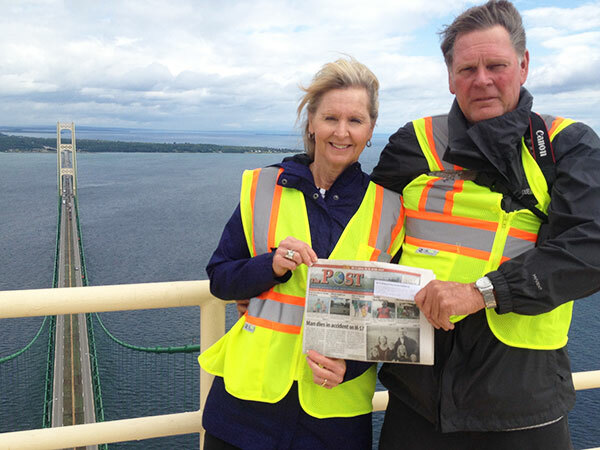 For the fifth year in a row, the MBA and the Michigan Department of Transportation (MDOT) are asking the public to share their bridge walk experiences on social media with photos and videos. One person sharing their memories will be chosen at random to receive a once-in-a-lifetime tour to the top of the Mackinac Bridge. Memories can be posted on MDOT’s Facebook page at www.facebook.com/MichiganDOT, or on Instagram or Twitter using the hashtag #MightyMacWalk16. For contest details, go to the MDOT website: www.michigan.gov/mdot. Jeffrey and Sherrie Peters, of Solon Township, took the Post with them on a trip to Hessel Bay, about 10 miles east of the Mackinac Bridge. 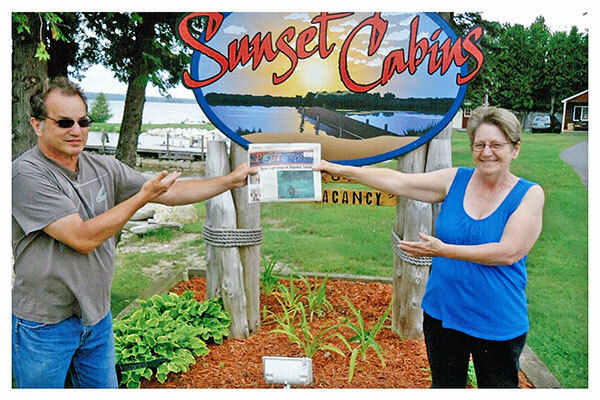 “It’s a good getaway for anyone,” said Sherrie. “We just relaxed.” They commented that they have good restaurants and good fishing. Thank you, Jeffrey and Sherrie, for taking us with you! 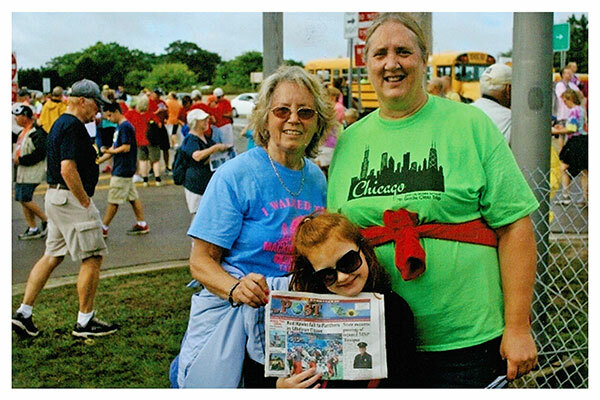 On Labor Day, September 7, 2015, the Post walked across the Mackinac Bridge with Rose Hankins, her daughter Vickie Totten, and great-granddaughter, Addy Rose. Great job to all of you, and thanks for taking us with you! What started out as a way to keep her husband fit and healthy has turned into something more for a local runner. Tammy Dewey, of Algoma Township, will lead the way across the Mackinac Bridge at sunrise, along with nearly 400 other runners, before the traditional Mackinac Bridge Labor Day Walk on Monday, September 5. She was selected as one of the 400 runners in the Mackinac Bridge Labor Day Run lottery, and her inspiring story helped her to be chosen as one of 11 fitness ambassadors by the Governor’s Council on Physical Fitness, Health and Sports. As a fitness ambassador, Dewey serves as a role model for health, fitness and physical activity to all Michigan residents. Dewey, a respiratory therapist for Metron in Greenville and Cedar Springs, said she began running after her second husband, Dan, was diagnosed with the same cancer that had taken the life of her first husband. To keep her husband fit and healthy for a liver transplant, she began to exercise with him. “He was walking the trail, and I was running back and forth,” she said. Her husband received a liver transplant two years ago at University of Michigan and is now healthy. And Dewey is still running. She runs 25-35 miles weekly on nearby trails and tries to run at least one 5K or 10K race monthly. Dewey and her sister have also participated in the Fifth Third River Bank Run every year since 2007, which was Dewey’s first race. To sweeten the deal even more, her daughter, Janna Miller, 27, also was chosen through the lottery. “I really wanted to run it with her. We get to do it together,” she said. Dewey also has a son, Jim Eddy, 30, and two grandchildren. For more info on the Michigan Fitness Foundation, visit www.michiganfitness.org.